You may think that as Autumn draws in, the time has come to hang up your trowel and head inside; but the truth is, during September you can still get out there and tend to your glorious garden. It is simply a case of understanding what to focus on. To help you to relish your outdoor space for a few more weeks, we have put together our guide to planting, maintenance and garden care in September. September still boasts some warm and sunny days, so use one of these to collect up all your seeds from the garden. You will need to pop the seeds or seed heads into a paper bag and mark them up with a permanent marker, ready for spring. Onions can be planted during the colder months and we have to say that our favourites are shallots. 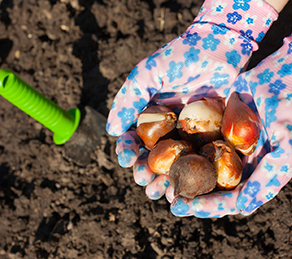 So why not buy a few bulbs and get ready to pop them into your garden? Come the spring you will hopefully have a beautiful crop of delicious shallots ready for cooking and enjoying. Your lawn will work hard during the summer, so the cooler Autumn months mean that it has earnt a bit of a treat. You can buy an autumn feed from a variety of garden centres, these will be need to be high in potassium and low in nitrogen; perfect for those cool temperatures. Many of us pop our houseplants outside during the summer months, however, September means that you should be bringing them back in. It is a good idea to inspect them beforehand, just to make sure that any beasties are not calling it their home. It isn’t just your plants and blooms that need some attention in September. You can also use it as an opportunity to give your garden a bit of a clear out. If you have a pond, then there is a good chance that it may be looking a little overgrown. Plants should only cover around 50 per cent of your pond surface, so if it is any more than this, you may want to cut some back. Some plant eating pests, such as vine weevils, are known to hatch in the Autumn, just so they can spend their winter eating up all your carefully grown plant roots. So, there has never been a better time than now to treat them. 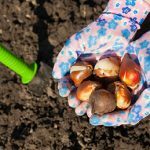 Whilst daffodil bulbs are best planted in the first week or two of September, there is still time to pop them into your garden, ready for the summer! So now you know, September is a month that still means you can get out there and enjoy your garden for a little bit longer! Next Post	How to get your kids interested in gardening.